Yohannes Christian John or Chris John was born in Banjarnegara, 14 September 1979, was the second son of four children of the couple Johan Tjahjadi (aka Tjia Foek Sem) and Maria Warsini. Father Chris John, Johan Tjahjadi a former amateur boxer, Chris John and his brother train Adrian since they were early age, around the age of 5 years. After competing in several amateur championships in Banjarnegara, Chris John was recruited by renowned boxing trainer, Sutan Rambing, in Semarang. He was a boxer Indonesia. He was listed as the third Indonesian boxer who won the world title, after Ellyas Pical and Nico Thomas. Chris John and then plunge into the world of professional boxing debut in 1998 in the fight against the Word Kanda. At that Chris John won the match 6 numbers in the round. His name was then shot like a meteor when he managed time idol boxer, Muhammad Alfaridzi, in a thrilling match for 12 rounds. Chris John was hit twice knockdown in round one, but he managed to reverse the situation by knocking Alfaridzi in round 12, while national champion featherweight. According to Chris John, the condition is very bad at the time, and he was bleeding at the nose because of a broken nose. After a few times a game in the race for the national title, Chris John successfully beat compatriot wrongs Sundava in 2001 to win the PABA featherweight title. Opportunity for Chris John and Indonesia arrived at the chance to face Chris John Oscar Leon of Colombia on 26 September 2003 in Bali. Chris John won slim figure (split decision) in a 12-round match, and otherwise entitled to the interim WBA world title (interim title). Soon, the WBA "grant" definitive title (no longer interim title), Chris John, when the defending champion Derrick Gainer of the United States lost points from Juan Manuel Marquez (Mexico, IBF champion). At that time, according to regulatory agency WBA boxing, Marquez declared the champion super (super champion) because it managed to unite two WBA WBA and IBF, and Chris John as regular champion. 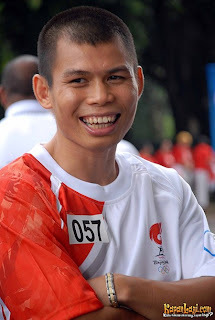 Chris John is married to Anna Maria Megawati, a former wushu athlete, in 2005, and has been blessed with two daughters. named Maria and Maria Rosa Luna Ferisha Christiani. Besides boxing athlete, Chris John also was known as a national wushu athlete. The success of Chris in the boxing world, took him to a side profession, including commercials for various products and boxing commentator on television. Besides boxer, Chris John is a wushu athletes who excel, which won gold at 52 kg class at the Jakarta SEA Games in 1997, and the bronze medal of the same class at the SEA Games in Kuala Lumpur 2001. In collaboration with designer Samuel Wattimena are always providing daily wear for Chris John.